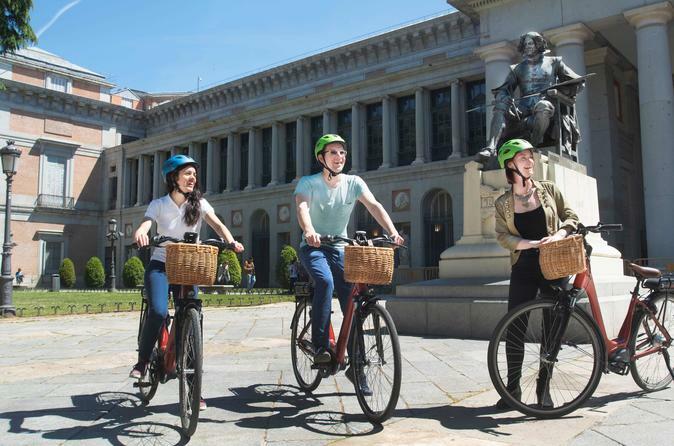 Embark on a journey through Spain's culture in a guided ebike tour of Madrid's city center, that will lead you to the most beautiful neighbourhoods, the most important museums, and the city's most outstanding sights. This guided ebike tour will show you the most emblematic places of the city that was home to famous painters and writers. You will visit Malasaña and Barrio de las Letras, two of the most important neighbourhoods to Madrid's art scene, as well as the famous Paseo del Arte. The tour starts at Plaza de España, from where you will take off with a ride through the medieval Madrid de los Austrias and the Barrio de las Letras, beautiful neighbourhoods whose history is as interesting as the lively atmosphere you can experience here nowadays. With your guide, you will continue to reach the Lavapiés district and the Paseo del Arte, the are where several of the country's most important museums are located, most notably the Prado, the Thyssen-Bornemisza and the Reina Sofía Art Museum. Next, you will visit the park Jardines del Buen Retiro, the big city park in the center of Madrid with sights such as the pond, the Palacio de Cristal, the Palacio de Velázquez and the Monumento al Ángel Caído (Monument to the Fallen Angel). After exiting the Retiro Park and seeing the old city gate Puerta de Alcalá, you will continue to the Plaza de Neptuno and the Royal Academy of Fine Arts of San Fernando, before entering the Malasaña district with its characteristic streets full of bars and small shops. Thereafter, you will return to Plaza de España, visiting the area around the Gran Vía boulevard, where many well-known theaters opened their doors in the 20th century, before finishing the tour back at the initial start point.